Miss Today’s Show? Listen To The Full Show Now! Mayor Ed Koch: One of the nicest and most engaging men Gary ever met. 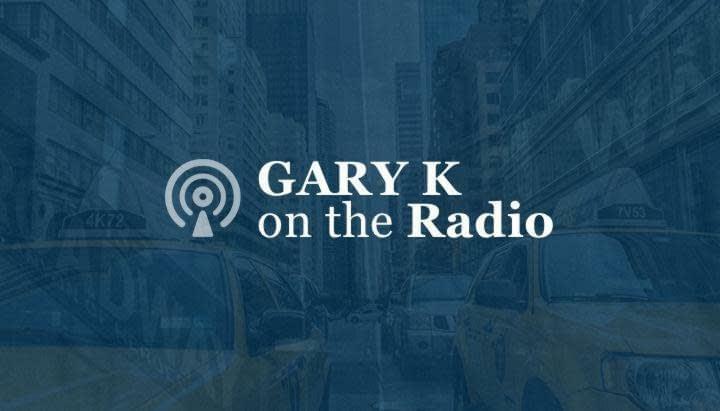 Market Wrap & Sector Analysis: Gary provides an in-depth view of the current state of the market, covers the important events that happened on Wall Street today. After Hour Highlights, News, & Movers of the Day: Gary covers all the big movers of the day and guides you through the important after hours action. Gary’s SuperBowl Pick: You will have to listen to find out! Look Out For Stocks That Look like CLSN: Gary gives you important clues on what to look for when buying stocks. CLSN plunged 81% on Thursday! After Hour Highlights & Movers of the Day: Gary covers all the big movers of the day and guides you through the important after hours action. GDP And Why You Have To Do Your Own Homework: Find out what Gary thinks about last quarters GDP. Miss Today’s Show? Listen To The Full Show Here! Market Wrap & Sector Analysis: Gary provides an in-depth view of the current state of the market, covers the important events that happened on Wall Street today, and highlights several leading sectors in the market right now. Gary’s Take On the Fed: You are going to have to listen to get his take- and trust us- it is a GOOD! Apple Losing Its “Cool” Factor On Campus?. Find out what that means for Apple’s stock? In answer to your couple hundred emails over the past day, here’s my take on the debate. Here’s what I say each and every one of you should do. Go get a video of the debate on your and shut the sound off. And just watch it. That’s all. Not listen to it. Just watch it. Then, turn it on and listen to it. In my world, there’s a word for what I saw last night. You see, I knew exactly what each of those people were going to say. Joe Biden was going to defend the past four years come heck or high water. And you may agree or disagree with him. Paul Ryan’s just was to promote the policies that they’re looking to do going forward while defining the record of the past four years of Joe Biden and President Obama. Well, I watched. I listened. Today, I watched and didn’t listen. There’s one word that comes to mind from me. Joe Biden was a creep for 90 minutes. These debates are humongously important for getting a feel for these people. Not what they’re doing to say, but who they are. How they are. Temperament. Knowledge. And, of course, what they want to do. “The Creep” ruined the whole 90 minutes. It did not matter to me what he even said. It did not matter to me whether he lied, told the truth, parted the seas, defined Romney as a bum, and a liar – it did not matter. 90 minutes of a creep. That’s the best way I can put it. And if you don’t believe me go watch it without the sound and look at this many and his condescending creepy mannerisms, and his disrespect of a sitting congressman who is running for Vice President. For me that define a creep. 82 times in 90 minutes there were interruptions from the creep. And the moderator was almost as bad. I was amazed to watch anybody say anything good about the moderator. Here’s the big worry. They prepped this guy! So the question is, did they prep him to a creep? Or was he a creep on his own? A creep! A disrespectful condescending child-like creep, with a lot of fake teeth that almost made me put on sunglasses. And he blew away any good that he may have said, because I didn’t listen a word he said. What a damn shame. And I was actually happy to see intellectually honest Democrats and liberals blasting the creep. Of course the people in the tank won’t say anything bad. But I don’t even know what to say. What a shame. Go get a tape of the Sarah Palin / Joe Biden debate and you will see a man in Joe Biden that was respectful, even tempered, and not interrupting. So I don’t know what gives or what the points and it’s even more scary if someone told him to act like this. And in the last five minutes, it was like someone popped him a valium. Notice I’m not talking about Ryan. I don’t have anything to say. He stated his case. Wasn’t powerful. And that’s that. Debates are not just about what you say. It’s about how you say it and how you look. And ladies and gentlemen, that guy looked like a creep…and he’s been Vice President for four years. You know, I remember when the media, the con artist lapdog, paws in the air media destroyed Sarah Palin saying she would have been a heartbeat away if John McCain would have won the last election. Well, I’ve got news for each and every one of you that said that. This guy is a heartbeat away! And that scares the heck out of me. Speaking of creepy, the markets were just very icky wicky. And the indices didn’t much today. But just still, underneath the surface, there was a little more deterioration today and it just doesn’t feel good this second. The New High list has contracted markedly. Leadership in the growth space has deteriorated. Leadership anywhere has basically deteriorated. Since the market’s never going down again – well, it will eventually go down – but right now we have Japan, United States, Europe, and China all doing their best to lift things. Japan is printing money. They have zero percent interest rates. Europe is printing money. We are printing money. We have zero percent interest rates. And China is now doing all kinds of things. And I got news for you. That helps markets. Because it helps markets when you see the economic numbers that I’ve been seeing, that have been continuously blah. The Transports were down 141 today. What was the story. Norfolk Southern (NSC) warned. That stock was shellacked to the turn of 6.60…major ugly yuck on almost 8x average volume. And if you look at the weekly on Norfolk Southern, that is real bad. Of course, that influenced CSX, Union Pacific (which has been the strongest name and which has now dropped below the 50-day moving average), and Kansas City Southern (CSU). The past four months, the Transports have continued underperform badly on the back of the rails, but also the airlines because of rising oil prices. It bears repeating. There is something called the Dow Theory, where if the Transports and not acting well and the Dow is, the Dow is coming down and the market’s coming down. I don’t not agree with this theory. I don’t not believe it’s 100%. What I would rather do is say, just don’t own the Transports. And if the market decides to come in and decides to top, I’ll deal with that when it shows. And on a day like today when the Transports were down almost 150, the market was down during the day and finished near flat-line, even though the internals were not very good. The fact of the matter is, the banks are acting fine. The commodities, while they pulled back the past three days, looks like a normal pullback. And the Fed, ECB and Japan are printing money. And China is spending this, that and the other thing. That matters. We’re not dealing with small amounts. We’re dealing with monstrous amounts that manipulate markets. Until the markets stop reacting to them, you’re better off to stay with them. If just by reading the economic news and about the deficits and about what’s happening Europe and China – you’d think the Dow was at 9,000. I don’t think I’ve been to a JC Penny store since I was 15. And gotta tell you, if you’re shareholder, I’d be so PO’d right now. In case you don’t know, JC Penny hired away the head of retail for the Apple stores. He is the CEO of JC Penny and he was formerly the Senior VP of Retail Operations for Apple. Basically, he came in and dropped all the sales. And the whole retail industry laughed at them. The stock originally had a bump when they announced that he had joined JC Penny, but you can’t not have sales. People want to feel they getting a bargain. Anyway, the stock has dropped from 43 to 19. Of course, the past two quarters, they lost .25 a share on a drop of 20% in revenue. And on this last quarter ending July 31st, there was a loss of .37 on a 23% drop. But recently, they came out with this new concept of having different kinds of shops in the JC Penny stores. There are those who think he’s nuts and those who think this is going to change the face of retail and he’s going to be right. Well, I’ve got news for you, I don’t have a clue. The question is, why do the consumers need to go into JC Penny, when they go into a mall anyhow? Well that’s not my point. Yesterday, they had some conference with analysts, going through all these changes and this, that and the other thing. And the stock rallied from 29 to 32.5. After they’re done going through all that and the stock is rallying…oh by the way business stinks. And the stock closed at 29. So anybody that bought yesterday is getting kicked in the rear end – and it drops another 3.25 down to 25.83 on a worsening outlook. So here’s my memo and message to anyone that works at JC Penny. You need to speak to your CEO. If you’re going to hold a big presentation and you have divergent news, do it before the open or after the close. Why? Because you screwed some investors. You get my point? This is a guy who is not handling Wall Street very well. And he better start handling Wall Street. It counts. Apple (AAPL) came out with the iPhone 5 today. Preorders are September 14 and we’ll see how many are sold and that’s what the market’s going to look at. Apple stock today, when all was said and done, was up 3…down 3…up 3…down 3 – it wasn’t even moving. Except someone was lying in the weeds because it did finish up 9 on the day and, to be clear, it was down 3 at 3:30. At 3:40 Apple was up 1. Apple went up 6 in the last five minutes…and is up another dollar in the aftermarket. To be clear and blunt here, my guess (which means absolutely zero) is that they’re going to sell a bunch regardless of whether it’s worth it or not. I’m reading a bunch of smart people on the web. One guy came out and said, there’s nothing to it. There’s no reason to buy it, except that it looks better here and there and maybe has a longer battery life. Other people are acting like it’s the 2nd Coming. So we’ll let the market decide. Technically, the Apple went back into the range is been in for the past four weeks and that’s the market’s going to look at. Again, it sickens and disgusts me that we have to wait for the head of the Fed, Ben Bernanke and his minions to come out with more policy tomorrow…after teasing markets going into Jackson Hole basically telegraphing more printing of money. If it doesn’t, there goes the market. This dude has set the market up. And you know me, I had the money printing, interference and manipulation. But the other side of the equation is that if he screws Wall Street, it may not be a very good day. But I have to figure that because he is a political hack who wants to keep his job which means getting Obama re-elected, he’s going to do everything possible. Now, here’s the other side of the coin. What if the market sells off on the news? We’ll cross that bridge. All we know is that the S&P 500 has moved out of range. The Nasdaq has moved out of range. Other areas have not, but they’re just right behind. All we can do, if distribution starts to rear its ugly head, is deal with it if that occurs. We’re having a contest. Name the Dow at the end of the year. We’ll give out a $1000 in cash to each of the top three guessers. You’ll have until next Tuesday night. You just have to email me at GaryK.com what you think the Dow will be at, at the end of the year. I just need your name and the city you’re emailing from. That’s it. If you want to put your phone number, that’s fine. There’s this company called Apple (AAPL). Basically, as the Apple goes, the Nasdaq and Nasdaq-100 have been going. It’s been driving the market. It really has. As you know Apple is coming out with the iPhone 5 in the next week or two. I have no idea how good it’s going to be. But we do know that Apple got smacked today on volume and it affected the market today. It’s what’s called a bellwether. Bellwethers do change. I remember in the early-1990s – you know what the hottest stock was? Coca Cola (KO). Then, toward the mid-1990s the bellwethers will American Online (AOL) and the Internet stocks such as Intel (INTL), Microsoft (MSFT), Dell (DELL)…but things change. I have to tell you, Apple had more influence today than I’ve seen in a while. As the markets were kinda sort okay and then Apple started to sell, then everything went with it, to a certain extent. It is going to be something to watch. Volume was light today on the drop and that’s good news. But I never, ever want to see breakouts, especially in markets – fail. I wouldn’t call today a failed breakout, but for sure, it was not a good day. I never want to see the Nasdaq and Nasdaq-100 under the perform the rest of the areas. So I’m going to be watching very closely the next few days, lead up to Thursday, when the Fed speaks. I don’t know what they’re going to say, what they’re going to do, how much money they’re going to print – I don’t know. It would be trouble. Last quarter’s earnings decelerated. Revenues decelerated. But so far every one of their phones, except for 4s which was an in-betweener, has done well. But Apple was down 18 today and that’s what caused the drop in the market. Mellanox Technologies (MLNX). It’s has been a very strong stock. It gapped up on earnings. It went from 95 after the gap to 120. In the past few days, it’s gone from 120 to 101 and then it hit 95 today. Two things happened. Intel (INTC) had a warning on Friday. And because Intel does some business with Mellanox, that affect it. I don’t own the stock right now. But if I did, a break of the 10-week/50-day moving average on heavy volume on a closing basis would be a pretty decent sell signal. But I must tell that what happened on Friday was also a decent sell signal, in that it broke from the top. Today was like a double break from the top. Recognize that there’s some serious distribution going on. Intel (INTC). Two weeks ago, I told my radio show listeners that that Intel was acting terribly. Intel started breaking down a couple a Thursday’s ago and I knew that they had a knew mid-quarter update and that warned big-time and they had missed by billions in sales. It was down another buck today to 23.25, breaking support again on big volume. So that has a lot to do with Dell (DELL) and Hewlett Packard (HPQ) in that there were less sales of PCs and laptops as well as the infiltration of the tablet business. If I was to make a blanket statement about Intel, I just wouldn’t be owning this thing. And if Intel continues to go down, it could hurt the Nasdaq and the Semiconductors. What’s happened in the past 2 or 3 days? Nothing. The market’s in wait and see mode. And it’s sickening, as a market person, to have to deal with the things we’re having to deal with. I have to tell you, when it comes to Fed, nobody ever use to talk. Alan Greenspan never used to say a thing. And every month they used to have their meeting and typically they wouldn’t do anything. The only time they would do something is if the economy went into some sort of recession. If the economy was really slowing down, they’d lower interest rates by a quarter of point…and maybe throw in another quarter the next month…and then the next month. And then as the economy got better, they’d start raising rates to hold off inflation and that was it. But now, for some reason the tape is has come off the months of all the Fed Heads and on top of that, we have this. You know what I think the final outcome of all of this is. I don’t know when or where because there’s nothing they’ve ever done that hasn’t created big bubbles because all they do use more debt and leverage and fake money (printed money out of thin air). And so what we’re waiting for is for Ben Bernanke to do a speech in Jackson Hole, Wyoming. And the expectation is that he is going to announce more printing of dollars that he doesn’t having in order to buy bonds to lower interest rates in order to help the economy, even though the 10-year is already down 1.65 and the 30-year is at 2.76. And as I have told you, he doesn’t care about the economy at this point in time because he can’t do anything about. His goal is just to get the market up because he thinks if the market goes up, the wealth effect will cause people to feel more rich and they’ll spend more. #1, he’s screwing the savers by keeping the rates at zero. And #2, we don’t know what he’s playing with. No one can even fathom this over the top, monolithic, never before seen in history by the umpteenth power, easy money policy of zero percent rates, the outright printing of money, and manipulating and inferring with biggest market in the world – our bond market. We’re heading toward Labor Day. It’s the end of the summer. It usually quiets down. Who the heck wants to commit a dime because if he Bernanke announces a couple trillion bucks, maybe the market rallies. Of maybe the market just changes and shoots a certain finger up at Ben Bernanke and goes down on that news. Or if he does nothing – who knows? But here’s the problem. Out of the past six days, we’ve had several comments out of Fed Heads. And you what? They all contradicted each other. And Bernanke intimated – didn’t say – but intimated that “We’ll we’re looking at printing more money. And that’s what everybody’s waiting for. This is what we have to wait for. A man who has never ever run a business, had a payroll, was fired, had to fire, or anything that has to do with business. Never been in the markets. Been an academic and a government hack since day one. Been wrong 90% of the time. Missed the whole housing crisis and only reacted after prices were already in depression. Said sub-prime lending was okay – with him and Alan Greenspan. And while things were in a debacle, he was saying things were contained and that the housing market would not affect the economy – until it did. And what was his answer to the problems that we’re caused by too much easing and leverage and debt? MORE EASING AND LEVERAGE AND DEBT. …because that’s all these people know. Create more money. So we’ll see. As I have said before, I hope I’m wrong. But I have to tell you something. You see that Internet Bubble and that Housing Bubble? What we’re seeing in the bond market is going to overshadow those bubbles, like we haven’t seen. That usually the cause and effect of what they’re doing. Of course, everything’s okay right now. Why? Because as long as the market’s cooperating…we’re good. But if the market blows up – we’re not good. So keep your fingers crossed. We are 12 years into the secular bear market and valuations have come down over those 12 years. And there is a thought process in my mind where if we can get passed these deficits and have some real serious people Washington do something about these their stupidity, that there’s another secular bull market around the corner. These secular bear markets usually last about 13 to 16 years and we’re entering year 13 in the year 2013. So we’re watching closely for that. Why? Because everybody’s so depressed and they’re thinking a depression is coming. Everybody thinks we’re in a recession. Harry Dent thinks we’re doing to 5,000 on the Dow and he’s been wrong 90% of the time also. Bill Gross, a bond guy says don’t be in equities ever. That’s good. More and more people are selling mutual and getting the heck out of the market. That’s what happened in the late 1970s and then in 1982 we started an 18 year bull market like we’ve never seen. So I’m counting and that we’re going to watch closely.